A geiger counter detects nuclear radiation by measuring the emission of ionizing radiation of alpha particles, beta particles and gamma rays. Also referred to as a radiation detector, a geiger counter consists of two main elements: the processing electronics and the geiger tube. The geiger tube is filled with low-pressure inert gas like helium, argon or neon. If radioactive radiation occurs, the inert gas is ionized. An anode within the geiger tube registers the quantity of ionized particles numerically correlating with the strength of the radioactive radiation. 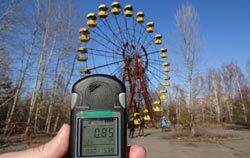 The radioactivity measurement is then displayed on the LCD screen of the geiger counter or radiation detector. It is very important to measure radioactivity as well as to classify radioactivity values. For example, terrestrial gamma radiation is measured according to general values from 0.03 - 0.3 µSv/h (microsievert / hour). This "normal" oscillation range is conditioned by natural radioactive elements in the ground such as uranium and potassium. To calculate this factor, one must take into consideration cosmic radiation. For example, when considering cosmic radiation, the maximum radioactivity content at Schneefernerhaus, the highest-located German environmental research station, is approximately equal to 110 µSv/h. 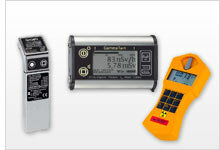 At PCE Instruments, you will find three types of geiger counter or raditation detection devices to help you measure radioactivity: 1) alpha radioactivity meters, 2) meters for detecting alpha, beta and gamma radioactivity and 3) radioactivity meters for human beings. 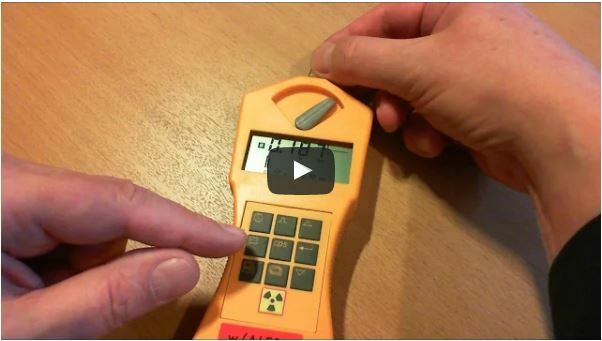 To learn more about geiger counter applications and how to detect radioactivity, please watch the video and read the information provided below. The Geiger counter is an instrument that measures ionizing radiation. It is one of the most popular radiation devices that detects alpha and beta particles and gamma rays.it can be used for both professional and private purposes. Do not underestimate the importance of measuring radiation in everyday life. It should always be controlled as it influences our health and can be life threatening. Radiation is extremely harmful, completely invisible and very difficult to detect. With the help of our device you have a chance to react to new danger in time especially if you live near nuclear power facilities. You will be able to find out what is in the atmosphere after an incident or leakage of radioactive coolant. If you are moving to a new place the Geiger counter will measure the radiation level of this area and of the materials that your house is built of. It is widely used in physics, fire and police departments, environmental institutions, geology for checking rock and minerals, for educational demonstrations and in variety of industrial fields. Portable models are light and easy to carry around. So the counter can always be at your disposal for checking food and water, construction materials and other things that you buy. What is Geiger counter and how does it work? Geiger counter consists of a tube filled with low pressured inert gas (argon, neon, helium). This tube is usually made of metal or glass. 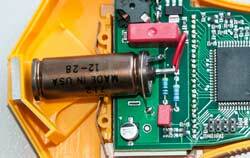 Inside the tube there are two electrodes (cathode and anode) to which a DC high voltage is supplied through a special load resistor. If high-energy particles get inside the tube, they collide with the gas and releasing more electrons. Negatively charged electrons are instantly attracted by the high-voltage positive wire. Too many electrons around the wire create an electric current which in turn generates an electric pulse that is registered on a meter. The radioactivity is then displayed on the LCD. The backlit allows you easily take the readings in different environmental conditions. An alarm generates acoustic and visual signals or vibration when the radiation dose exceeds the limits. If the level of radiation becomes higher, intervals between alarm signals become shorter. Alarm limits, illumination, intervals of recording impulses and measuring periods are adjustable. Long-term measurements are possible thanks to the batteries that serve up to 10 years. Auto switch-off will turn off your device if you forget and will preserve the battery. This device calculates average and max values on the basis of which you can make reports and conclusions. It also determines the dose rate over a couple of days. Earphone input in some models enables you to listen to the minimal changes of contamination. Among additional functions you can find several measuring units, auto-zeroing and auto-ranging. Short calculation time gives you the results immediately so you don’t have to spend even a second in a dangerous place. Data is saved in internal memory and is preserved even after a battery change. Software and data cable that are included in the delivery simplify processing of the data and transferring it to the PC or other calculation programs such as Excel. We specialize in offering high-quality, sensitive and accurate Geiger counters for continuous protection against radiation. The main advantages of our counter are efficiency, quick operation and high technical characteristics. It also meets European and USA standards. This device is a must have instrument for every human being who cares about his health, his family and the environment that he lives in.